The Maldivian Democratic Party (MDP), on Saturday, secured two positions on Filladhoo Island Council in a by-election. According to the Elections Commission's (EC) tentative results of the polls which were held in the capital city of Male' as well as Filladhoo in Haa Alif Atoll, MDP candidates Abdulla Riyaz and Mohamed Shiyadh attained 352 and 289 votes respectively. 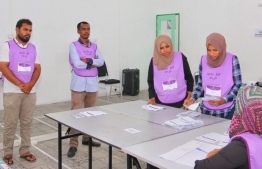 Their contestants from opposition Progressive Party of Maldives (PPM), Mohamed Moosa and Mariyam Zoona received 283 and 184 votes respectively. The by-election was held following the resignation of Council Vice President Mohamed Jaufar and Councillor Mohamed Naif. A total of 783 individuals were eligible to vote in the by-election, however only 575 cast their votes. The total population of Filladoo is 1,118.